Private debt collection agents are being used to go after business owners who owe rates but live outside Northern Ireland. Out-of-jurisdiction commercial debt, which previously was uncollectable, totalled £6.2m at the end of March. A trial exercise, carried out in 2017-2018, yielded £173,000 from 410 commercial debtors living outside NI. Land & Property Services (LPS) had never before used an external debt collector. The pilot exercise pursued debt in the Republic of Ireland, Britain, mainland Europe and the United States. "In the event of non-payment of rates, LPS will pursue recovery through the enforcement of judgements office or bankruptcy proceedings," a spokesman for the Department of Finance told BBC News NI. "During 2017-18, LPS also carried out a small trial of the use of external agencies as an additional debt collection option, and plans to continue to further trial this approach this year. "LPS has never used an external debt collection agent prior to this." "This approach has allowed LPS to target out-of-jurisdiction commercial debt, which previously had been uncollectable." In 2017-18, about £1.276bn was collected in both household and business rates, with roughly an even split between household and commercial. 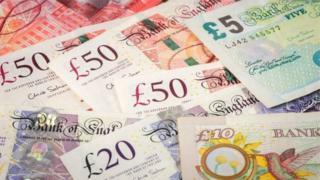 The outstanding rate debt - at £125.6m - is at its lowest level in nine years. The Department of Finance also revealed that the total rate write-off last year was £19.3m. The department said the "primary benefit" of using the debt collectors to recoup commercial rates overseas "was the presence and standing of the external collection agency outside the NI jurisdiction". This "elicited payment from ratepayers who LPS had previously been unable to take through the NI court system".